The U.S State Department special operator for Venezuela, Elliot Abrams, has revealed that Venezuela is already in possession numerous highly effective S-300 (Antey 2500 version) systems. This makes a military campaign against Venezuela highly unlikely, given the high-importance of air-cover for any boots on the ground, and the high effectiveness of the S-300 system. It also explains the decision of OAS member states Columbia and Brazil not to resort to military intervention against the Bolivarian Republic – a jungle war without air-cover would be extraordinarily costly in terms of casualties and the resulting social and political unrest. While the U.S military has known of this, until Abrams statement today there was a reluctance to report the problems posed by this, amid Trump’s war-drums surrounding his alleged ‘all options’ approach to Venezuela. Previously, FRN relayed a report from a private Israeli satellite giving the locations of the S-300 systems then believed to be in movement to strategic locations. While the source was questionable regarding alleged piece movement, it led to some confusion as to whether Venezuela indeed possessed the systems at all. CSS analysts are of the opinion that the U.S military’s knowledge of Venezuela’s relatively advanced anti-air capacities are one of the factors behind the now infamous Abrams confession that the U.S has no plans to ply a thorough military campaign against the Bolivarian socialist nation. In short Venezuela has at least six systems now operating, each system can target nearly 25 advanced fighters or attack planes simultaneously. This means that the Venezuelan anti-air forces could target 150 U.S fighters, bombers, attack planes, and even ballistic missiles simultaneously. With a hit rate of about 85%-90%, the U.S could expect to lose upwards of 130 planes in a sortie unless the SAM systems were overwhelmed. However, the U.S possesses about 1800 fighters and attack planes in its entire arsenal; many of these are deployed around the world and could not be used all to attack Venezuela, for numerous reasons including vulnerability and logistics. The S-300 system is effective against 4th and 5th generation U.S fighters and attack planes, as well as most bombers, when bombers lower altitude to avoid detection. Venezuela is said to have at least five of these Antey 2500 systems now forward deployed, and one S-300VM. These systems are extremely similar, and summarily it can be said that Venezuela has six S-300 systems comprised of several models of the system. The major revelation was made hours ago, when the U.S State Department subsequent to a closed door meeting, briefed media about its belief that the several planes of Russian military, numbering more than 100 personnel so far, are in Venezuela to help make sure the S-300’s are up to par. 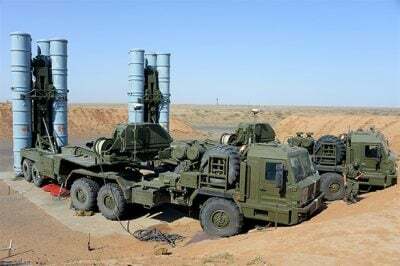 They are believed to be installing the latest computerated upgrades to Venezuela’s S-300 systems, also known as the Antey 2500, a very high-end export version above the S-300VM. This is known to be able to target and hit 4th fighters and attack jets, such as the F-16, F-14, and F/A-18, including the 4.5 generation of those makes, as well as 5th generation jets like the F-35 with an 85% success/hit rate. The Russians in Venezuela would be there to see that these S-300/Antey 2500’s are upgraded to effectively target U.S jets at a range of over 230 km, with the introduction of the 48N6E2 missile and similar. This upgraded system is apparently capable against not just short range ballistic missiles, but now also medium range ballistic missiles. It uses the 83M6E2 command and control system, consisting of the 54K6E2 command post vehicle and the 64N6E2 surveillance/detection radar. It employs the 30N6E2 fire control/illumination and guidance radar. Abrams pronouncements, however, that the Russians were there to perform electrical repair work required for the S-300’s in the aftermath of the black-out, is incoherent given that these systems are not operated on grid. It is likely that his statement was made to give some credibility to the possibility of a U.S attack, i.e., that such an attack upon Venezuela’s electric system could be replicated, and therefore the U.S air forces could attack during such a black-out. This is contrary to what is known about the electric systems that militaries rely on, including back-up generators or being off-grid to begin with. “In our opinion, one of the things the Russians are doing there is to help the authorities with the S-300 systems that have suffered from the blackouts,” special representative Abrams said. Abrams clarified that the US is not aware of what kind of maintenance is being provided by the Russian military, which on the face of it appeared to contradict his assertion from just moments earlier. In early March, the National Electricity Corporation of Venezuela reported sabotage on the large hydroelectric power station El Guri. The incident in Caracas and in 21 of the 23 states of the country suffered electrical black-outs. Nicolas Maduro blamed Washington for the incident. In turn, US Secretary of State Mike Pompeo denied these allegations, while tweets from American politicians such as Marco Rubio appeared to confirm U.S interference. On Saturday March 23rd, two airplanes with Russian servicemen arrived at the airport near Caracas for consultations on military-technical cooperation. According to local media reports, 99 military personnel were flown to Venezuela, and 35 tons of cargo were also delivered. As Foreign Ministry spokeswoman Maria Zakharova emphasized, the presence of Russian specialists is regulated by an agreement on military-technical cooperation between Moscow and Caracas.